I have been slack about posting. I want to add pictures all of the time. But my little digital camera is not taking good pictures. Everything is coming out dark and when I use the software to lighten, it just doesn't look right. I am still tinkering with it. I think the flash and the shutter are off sinc and there isn't much I can do about it. Probably a new one is in the near future. Patch has had a relapse this week. We went back to the vet this morning. Increased his insulin and he is better again. Lets hope this works. Now, what to do next?? I have some cowboy fabric to make a quilt for my nephews, wife's, 1st grandchild. I think I will do variable stars with the cowboys fussy cut for the center and bandanna fabric for the star points. Wont need to buy anymore fabric, that way. My men, DH and DS, are going Boy Scouting this weekend. DH is taking a rife and shotgun course, so he can teach. They are both attending the spring fellowship for the order of the arrow. By the way DS is not a boy anymore. He will be 21 on March 29. I just cant get used to it. RETREAT time. 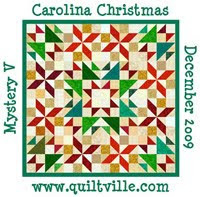 with the guys gone, I am off to the Mountains of NC to quilt with friends. The cowboy quilt will go with me. And probably one other project. Of course there will be shopping. She is not far from Johnson City and Jonesboro, TN. 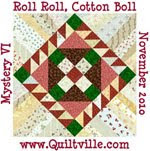 Both have nice quilt shops. And there is one in Hendersonville, on the way. And one in Burnsville, Ashville, Fletcher, and probably more I don't know about. That is not counting the Yarn shops. Better hope that tax return check comes soon. LOL I will be a fun time and Patch the Wonderdog gets to go with me, so I can keep and eye on him. Sounds like you are having a good time. Drive safely and leave some fabric for the other ladies, lol.Hope you get a camera soon, would love to see some of your quilts. Congratulations on your first trunk show, Vicki--I'm sure it well well. And come home with a lot of goodies from all the quilt shops! 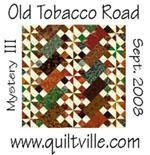 I'm hoping to go to Tennessee Quilts VERY soon.